If you’re getting a little dizzy from Imperial-this, Hapsburg-that, then take a short trip out to the Hundertwasserhaus for a little cranial retuning. Completed in 1985 at a cost of over €7 million, it’s an apartment house owned by the city of Vienna and rented out to individuals just like any other public-housing project. About 200 people live there. But this is no ordinary building, as a look at the photos reveals. The house is a mosaic of shapes, colors and pillars. The floors are uneven. The roof is carpeted with vegetation (900 tonnes of earth were used in constructing the terraces). And plants appear all over the place, often where you’d least expect them. The collage of colors isn’t quite as striking as in years past – city pollution has dampened the bright colors and turned the white into a dirty shade of light grey. Nevertheless, the whole construction remains a colorful antidote to modern architectural practice. You can’t look inside the house — which is as zany inside as it looks from the outside — as real people live there, but it’s free (of course) to wander around the outside. There you’ll find several themed cafes and shops, as well as a small information center, with posters, postcards, books and similar for sale. Oh yes, and there’s an old-style red British telephone box, too. 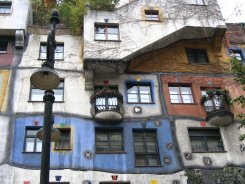 Artist Friedensreich Hundertwasser (together with architect Joseph Krawina) was the creative brain behind what has become one of Vienna’s most-visited attractions. 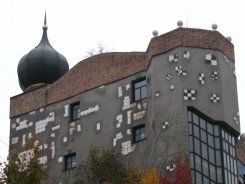 It was Hundertwasser’s first architectural work, though numerous followed, including a city incinerator. In keeping with the counter-convention of the house, it’s not located in any of the usual tourist areas. But it’s still only a couple of minutes from the center. Catch tram 1 to Hetzgasse.